2G is short for second-generation wireless telephone technology. 2G technologies allowed us to make voice calls, send SMS, picture messages, MMS (via GPRS), and connect to the internet via GPRS/EDGE. In order for 2G services to become available in the country, a telco must obtain a 2G license and must operate within the GSM frequency band/s allocated by the NTC. The GSM frequency bands used in most parts of the world are GSM-900 and GSM-1800. They are used in Europe, Middle East, Africa, Australia, Oceania (and most of Asia). While GSM-850 and GSM-1900 are used in Argentina, Brazil, Canada, the United States and many other countries in the Americas. In the Philippines, telcos operate in the GSM-900 or GSM-1800 bands to offer 2G services nationwide. 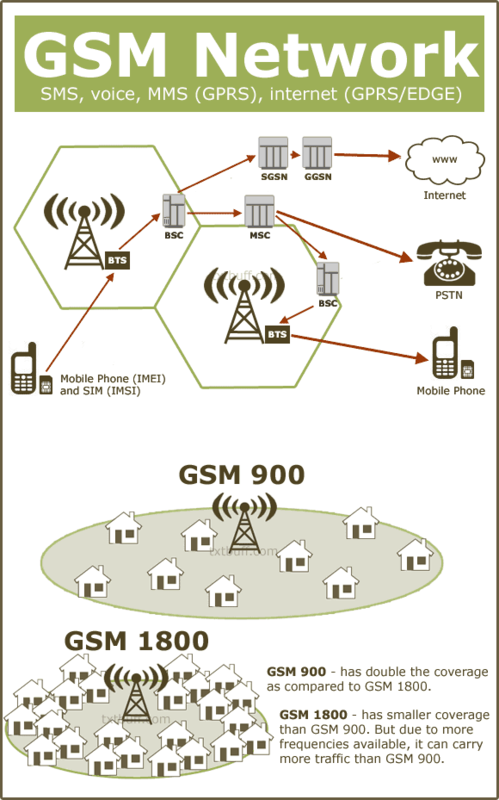 The difference between GSM-900 and GSM-1800 is that the GSM-900 has double the coverage as compared to GSM-1800. This is because as the frequency increases, cell size decreases due to the path loss increase. So in order to achieve full coverage for a particular area, more number of towers need to be erected in GSM-1800 than in GSM-900. But because there are more frequencies available on GSM-1800 band, more capacity can be catered for good traffic. This enables GSM-1800 to handle more subscribers than GSM-900. A balance of both can help achieve good coverage. GSM-900 uses 890–915 MHz to send information from the mobile station to the base station (uplink) and 935–960 MHz for the other direction (downlink). Duplex spacing of 45 MHz is used (890 MHz to 935 MHz). GSM-900 has lower propogation losses and has double the coverage as compared to GSM-1800. Initially, only 3 telecom operators were given frequency assignments on the GSM-900 bands; Globe, Smart and Islacom. In 1994, Islacom launched the country’s first digital mobile communication services using GSM world standard digital technology. Islacom was then acquired by Globe Telecom on June 27, 2001 and became 100%-owned subsidiary of Globe. NTC approved on August 1, 2002 the joint use of Islacom’s frequency by the Globe Group. In September 2002, Globe announced the operational integration of Globe and Islacom’s wireless networks. After the acquisition of Islacom, Globe now owns a total of 17.5 MHz in the 900 MHz frequency band. Smart, on the other hand, owns 7.5 MHz. GSM-1800 uses 1710–1785 MHz to send information from the mobile station to the base transceiver station (uplink) and 1805–1880 MHz for the other direction (downlink). Duplex spacing is 95 MHz. GSM-1800 frequencies can carry more traffic than GSM-900 due to more frequencies available. But GSM-1800 has high propogation losses so more number of sites are required (approx.1.5~2 times that of GSM-900). In August 2000, Bayantel obtained its GSM license for providing wireless services using 10MHz on the 1800 MHz frequency band. However, Bayantel has been delayed in rolling out its network due to litigation relating to the validity of its license. On August 7, 2000, Digitel was granted by the NTC a GSM license to offer digital wireless service on the 1800 MHz frequency band. Digitel began to build its network in 2000 and formally launched its wireless service under the brand name Sun Cellular in February 2003. On September 2001, NTC gave Extelcom 5 megahertz (MHz) frequency in the 1800 bandwidth for its planned GSM operations. They dropped their GSM plans in 2003 in favor of deploying a network based on the CDMA protocol. After the acquisition of Digitel, PLDT now owns a total of 37.5 MHz in the 1800 MHz frequency band. Are the above information still applicable nowadays?